Beautiful, alpine setting in the Bridger Canyon. 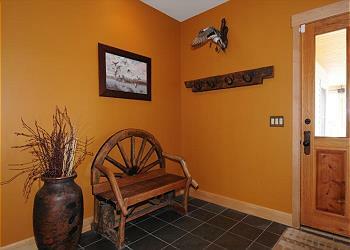 A mountain retreat, perfect for a family reunion or gathering of friends. Extra perks include an outdoor hot tub and high speed internet! BRIEF DESCRIPTION: This spacious five bedroom home enjoys a private location in Bridger Canyon, just ten minutes from Bozeman. 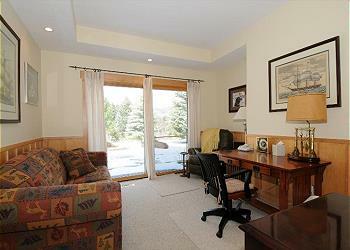 Guests will enjoy fantastic mountain views, lots of peace and quiet, and easy access to hiking from this home. An extra bonus is the outdoor hot tub, perfect for an evening of stargazing. 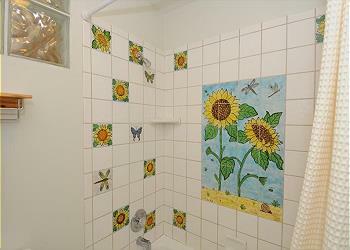 BEDROOMS AND BATHS: The home has four bedrooms, a studio with a pullout sofa and four and a half bathrooms. There is one additional pullout sofa in a small den for more flexible sleeping arrangements. The master bedroom is located upstairs and is very spacious with a California king size bed and large private bath that includes a deep soaking tub. On the lower level of the home are three more bedrooms. 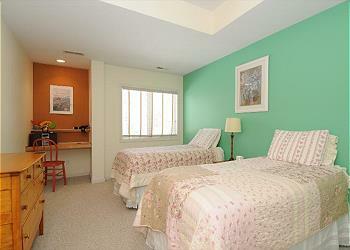 One of these bedrooms is set up with a queen size bed and a private bathroom. 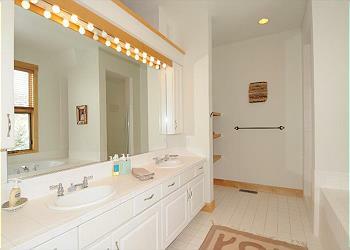 The other two bedrooms, (queen size bed in one, two twins in the other) share a bathroom. Then, through an exterior door from the lower level, there is another entrance to the house, where you will find a little studio set up with a full size pullout sofa and a private bathroom. The main level of the home, where you will find the living room, dining area, and kitchen, has a half bathroom. 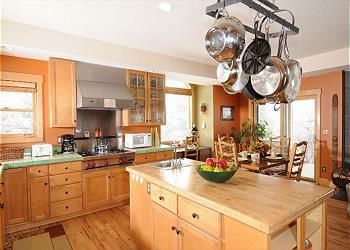 KITCHEN: This fully equipped kitchen has top of the line appliances and amenities. The kitchen has a Wolff gas range, stainless steel appliances, microwave, coffee maker and grinder, dishwasher, etc! It has absolutely everything you will need for any meal you have planned. There is a nice selection of cookware, serving ware and a good spice cabinet as well. Out on the deck you will find a gas barbecue grill and seating for those outdoors meals. 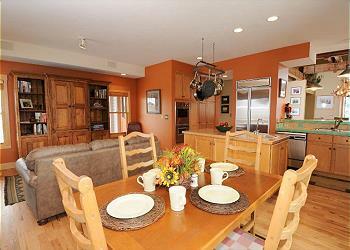 DINING AREA: There are two dining areas in the home. Adjoining the kitchen is a more casual seating area that will seat up to six at a time. Then, out in the great room is a more formal dining area that seats up to eight. LIVING ROOM: The living room is absolutely gorgeous, with high ceilings crossed by rugged structural beams. These beams were actually salvaged from a building in San Francisco after one of the major earthquakes. The focal point of the living room is the beautiful rock fireplace, but there is close competition as the view out the glass doors captures a fantastic look at the Bridger Mountain range. The kitchen area has another small gathering place set up with a couch, easy chair, wood burning stove and television with a DVD player and satellite service. There is also a small den in the west wing of the house, with a comfy couch for some private reading time and an exercise bike, in case inclement weather keeps you inside for a day! 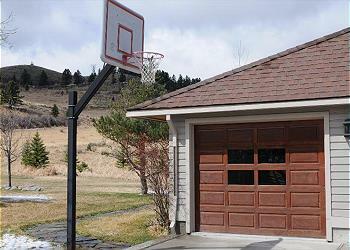 SETTING, ACREAGE, VIEWS: Bridger Hills Retreat is located on 14 private acres in the foothills of the Bridger Mountains. The home has lovely landscaping and open meadows in direct proximity to the home and some pretty groves of aspen trees out back. ACTIVITIES NEARBY: Besides hiking and mountain biking on nearby trails, there is fishing on the Gallatin River and Yellowstone Rivers -both rivers are just thirty minutes away. 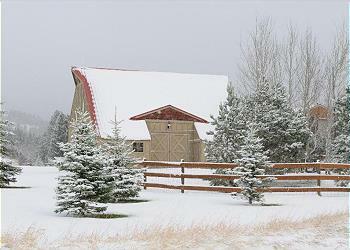 Guests can also spend time skiing at Bridger Bowl, which is just 8 miles away, horseback riding, rafting, golf, and everything that the towns of Bozeman and Livingston have to offer. Yellowstone National Park is only an hour and a half away. Special for Mountain Home guests: $50 credit towards a Yellowstone Park tour! For the very best experience in Yellowstone, book a private tour with our other service, Greater Yellowstone Guides. Our incredible guides have each been exploring and guiding in the region for over 20 years, so it promises to be a very special day. All Mountain Home guests get a discount on our Deluxe Tour cost using coupon code MH50GYG. 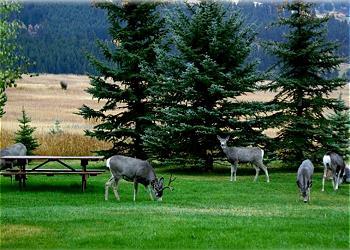 Call us to book both your lodging and a Yellowstone adventure! The home was spacious and inviting. A perfect base for our skiing. Only 8 minute drive to Bridger Bowl for fantastic skiing. The views were spectacular. We enjoyed watching a herd of elk on the ridge while sitting in the hot tub. Montana Homes were available if needed and that was so nice to know. We’ll be back! Thank you for the great review, Honor! 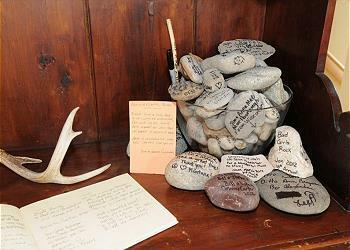 Sounds you caught a special sight with the elk herd! We hope to have you back! Fantastic!!! Beautiful home in a beautiful setting! Super comfortable and easy to use! Thank you so much! Hello Jenny! Thank you for your great review of Bridger Hills Retreat! We are so glad that your group enjoyed your stay and felt that the home was beautiful and comfortable. We hope to see you another time in the future! The layout of this home was perfect for our gathering. We had two families and a total of 10 people. We never once felt like we were on top of each other. The main floor set up was ideal for preparing meals and playing games. Thanks Chris and Matt for your wonderful review of Bridger Hills Retreat! We are very glad your families had space to spread out and enjoyed this beautiful home. Let us know whenever you are ready to plan another trip to Montana. We would love to help you find the perfect place for your next getaway. Thanks again and have a wonderful day! My children and my husbands family all came to honor my husband who was killed last year. We honored him at Bridger Bowl on the mountain. It was amazing. Then later in the day, my daughter was proposed to, in the same spot! Being able to come and go from this amazing house was perfection. We had so many breathtaking moments. Thank you Thank you! The home was simply gorgeous, with a view of the mountains from every door and window. Elk and Mule Deer everywhere. Amazing! Hello Mary! Thank you for sharing such a wonderful experience with your family with us! We are very glad that we could be even a small part of your trip and that Bridger Hills Retreat provided a comfortable place for everyone to gather. Thank you for your kind words about the home and sharing this beautiful story with us! We hope to see you again! Thank you very much for your glowing review of Bridger Hills Retreat! We are so very glad you had everything you needed for a relaxing and comfortable vacation and had room to stretch out! We absolutely love hearing that past guests have enjoyed one of our properties. We hope to have you back again!